After four fun days of being based in Birmingham, it was off to London. There were various options on how to make this journey, whether by train or bus, but in the end I decided to take the slow train. 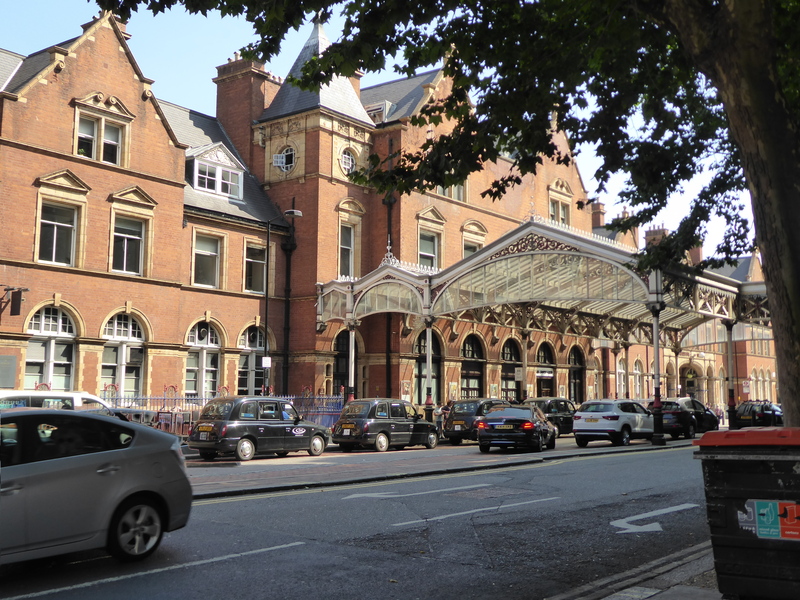 This train goes from alternate stations, Moor Street station in Birmingham and Marylbone station in London. The cost was much cheaper on this route than on Virgin, 25 pounds as opposed to 50. This 25 pounds was well worth losing 30 minutes. I made sure to get to the car with luggage racks as to put my luggage away. The ride was relaxing, much more pleasant than a car or bus journey. Upon arrival to London’s impressive Marylbone station, I had to decide how to get to my destination of Ashtead, Surrey. My options were to take the Underground or taxi/Uber to the local train station and take a suburban train from there, or to just take Uber all the way. I decided to take Uber all the way, as the price wasn’t that much more. The driver was from Bulgaria, as I asked when hearing the app talk in a foreign language. He recommended that I definitely visit Bulgaria in one of my future journeys if I had the chance. This ride turned out to be a blessing in disguise, as I basically got a tour of London. 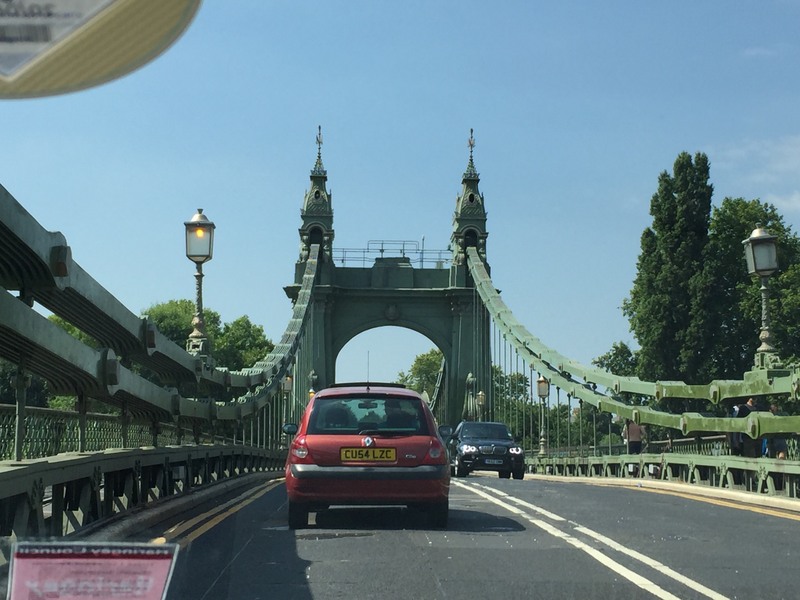 The best part was when we went across the Hammersmith Bridge. After one hour, I had arrived to my uncle’s house. I had tickets for a Shakespeare show outside at 230, but before we could go to this, we had to visit a pub as per the English tradition. 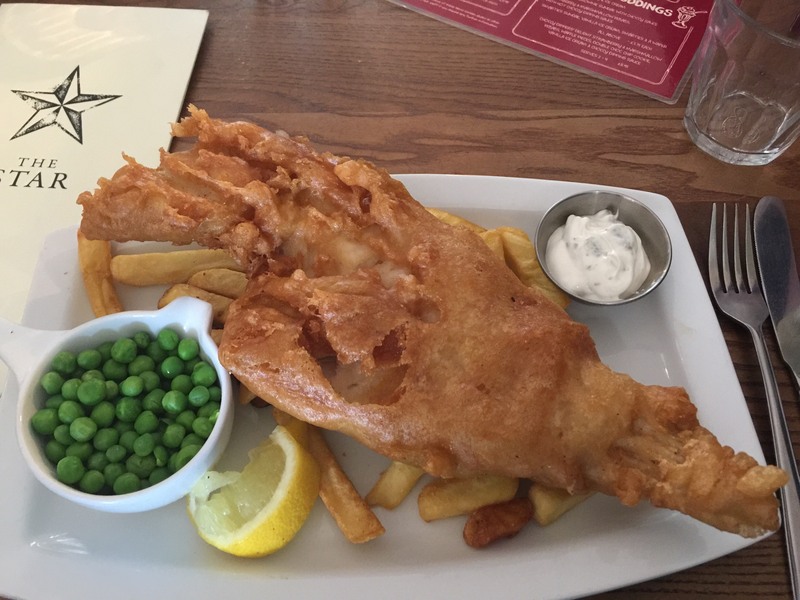 I ordered fish and chips, of course. I was stunned to see the size of the fish, it was significantly larger than the fish catch from last year. 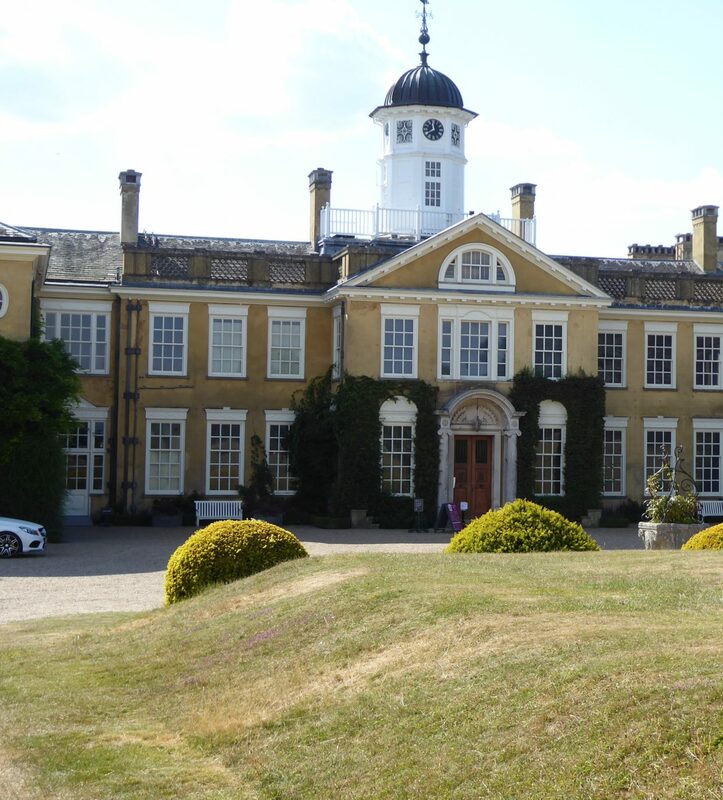 From here, it was onwards to the Shakespeare show “The Merry Wives of Windsor,” it was onwards to Polesden Lacey, a giant estate. I probably should have waited to purchase these tickets, as the weather was scorching outside. 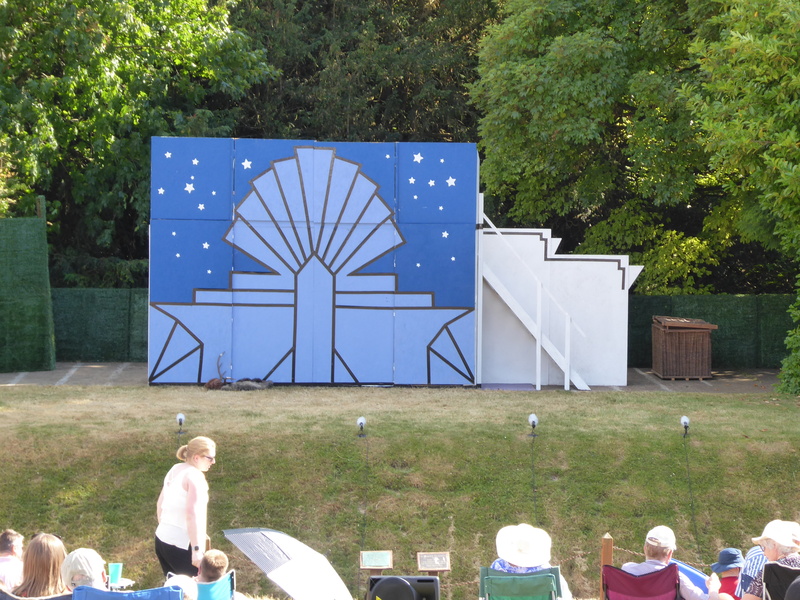 I felt sorry for the heavily dressed actors, who must have lost significant weight from sweating under heavy clothing. Also, the sound dies out in the air as opposed to echoing in a building, so I didn’t hear everything that was said. What I did hear, I didn’t understand much of either, as Shakespearian prose is difficult to follow. After two long hours, it was back home and time to plan where I was go to Europe for a few days before returning to London. In the end, the plan was set to take the Eurostar train to Rotterdam and then to Brussels before heading back. This was my first jaunt to those countries so I was excited as for what was ahead to come.